FOXBOROUGH, Mass. — Tom Brady is ready to play after cutting his right thumb with scissors in a "silly accident" before the Patriots' preseason game against the Bears last week. Brady said Tuesday he missed the first two practices this week for personal reasons, but that he's available and ready to play when New England visits Carolina on Friday. The 39-year-old quarterback has yet to appear in a game this preseason. He's got two more games before the start of an NFL-issued four-game regular-season suspension for his role in "Deflategate." He hasn't missed a regular-season start since 2008, when he suffered a torn ACL in his left knee during the season opener. Brady said the accident with the scissors occurred when he was trying to get something out of his cleat. The scissors slipped and cut his thumb, causing him to "let out probably a pretty loud word I wouldn't repeat in front of my kids." "I'm glad it wasn't the regular season and I learned from it, so hopefully won't be operating any more scissors for a while," Brady said. Brady said he wanted to play against Chicago, but coach Bill Belichick made the decision he'd sit out. It was a decision the former MVP agreed with. "It took a few days (to heal)," Brady said. "I wanted to go and coach said it's probably best if you — for what I was going to go out and do — just take it easy. So that's what I ended up doing. I wish I could have played. I've been missing playing. I want to get out there with my teammates." Belichick has said previously that Jimmy Garoppolo will start while Brady's out, with Brady returning to the starting role once his suspension ends prior to New England's game at Cleveland on Oct. 9. Asked if he expected to play Brady this week after being out the first two preseason games, Belichick said the priority remains getting Garoppolo ready. "All three quarterbacks are extremely important. Jimmy's preparation for the Arizona opener is the most important," Belichick said. "Nothing's changed, and nothing's gonna change. That's the way it's gonna be." Brady is eligible to participate in all preseason games and practices, but can't have contact with the team during his suspension. Though he's been a spectator so far this preseason, he said there has been a good dialogue with Garoppolo. 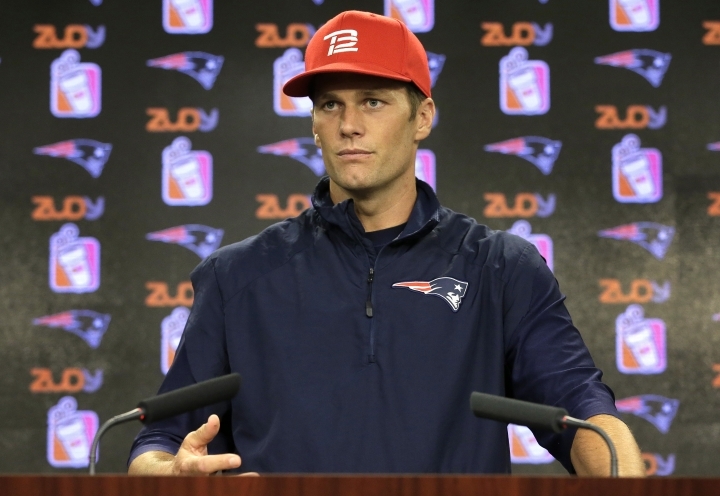 "We're in every meeting together and there's always a good back and forth in our room," Brady said. "I think that's really encouraged by (offensive coordinator Josh McDaniels) to speak up and say what you think. If you see someone maybe doing something a little bit different, we're always trying to be on the same page." He said how he will handle staying in football shape during the suspension is still to be determined. "I try to treat it no different," Brady said. "I've always tried to do the best I can do to prepare and be ready to go. That's the kind of mode that I've got to get into." NOTES: The Patriots released cornerback E.J. Biggers, running back Donald Brown and defensive lineman Frank Kearse. The roster currently stands at 83. Teams must reduce their active rosters to 75 players on Aug. 30.